A true Connoisseur will enjoy Chocolate Covered Pecans as a decadent indulgence. These sweet treats are often referred to as chocolate turtles. You can find some absolutely yummy chocolate pecans online at Fannie May Candies. Of course, Fannie May refers to them as Pixies. Well, regardless of what name you give them, the chocolate, caramel, and pecan blend will really make your mouth water. Here are a few other places that you can drool over and maybe even taste test. Grin! Hope you find some you'll really love. Want to make your own? 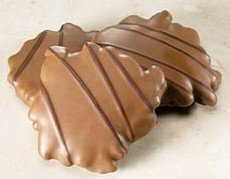 There are specific recipes for chocolate turtle candy, but you can give these other chocolate covered pecan recipes a try, too, and see if you don't add them to your favorites. In a double boiler melt the chocolate and shortening, stirring constantly until smooth. If you want to use the microwave, heat in 30 second intervals, stirring each time until smooth. Do not overheat. Add broken pecans and stir to thoroughly coat. Place by spoonfuls into mini paper candy cups. Chill until firm. 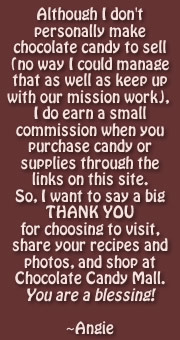 For an adorable collection of paper candy cups and other candy making supplies visit Candyland Crafts. Combine butter and brown sugar in a saucepan. Heat over medium high heat, stirring constantly until the temperature reaches 300 degrees F. on your candy thermometer. Immediately pour mixture into a greased 9 inch baking dish. Lay chocolate evenly across the top of the hot toffee to soften. Spread melted chocolate to cover completely. Sprinkle chopped pecans over the chocolate and press it in gently to set. Place dish in refrigerator to chill for 1 hour. Turn candy out onto waxed paper and break into pieces. Final Tip: Store chocolate pecan candy in an airtight container and hide. That is if you don't want everyone else to devour it!